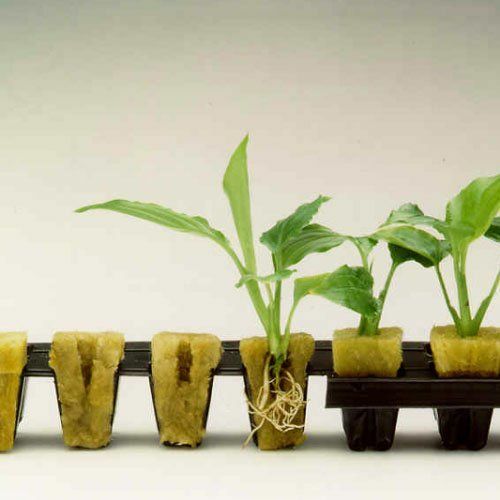 Rockwool is a versatile growing medium that can be used as a standalone product or in a variety of hydroponic systems. In this post, we will guide you through the basic process of how to use rockwool in hydroponic gardening. Purchase a pack of 1” rockwool cubes for seed propagation. These are typically sold in convenient packs that fit perfectly into a standard 10” x 20” plastic tray. Depending on the brand of rockwool you purchase, the following instructions may vary. Adjust the pH of the water to 5.5 using pH down or lemon water if you have that on hand. Test and adjust pH as needed using a pH kit or meter. Soak the rockwool until the medium is fully saturated. Do not squeeze the block because the material has been designed for an optimal air/water ratio for horticulture purposes. Plant seeds in each cube. Depending on the seed, you may want to plant multiple seeds in each cube. More information can be found from your seed supplier. Water your plants as needed using a diluted nutrient solution (typically 1/8 to 1/4 of the nutrients recommended for the nutrient solution). During the initial phases of the plant’s growth cycle, the plant will not need the full supply of macronutrients provided by the nutrient solution. The strength of the nutrient solution can increase as the plant grows into full maturity. Be mindful of overwatering as this will slow root development. The rockwool cubes are ready to be transplanted when the taproot is visible at the bottom of the cube. At this point you will want to determine where you would like to transfer your plants whether it’s a larger rockwool cube, a planter with loose material or a hydroponic system. Regardless of the system, make sure the new media is presoaked with nutrient solution or properly running prior to transplanting to reduce the risk of transplanting shock. 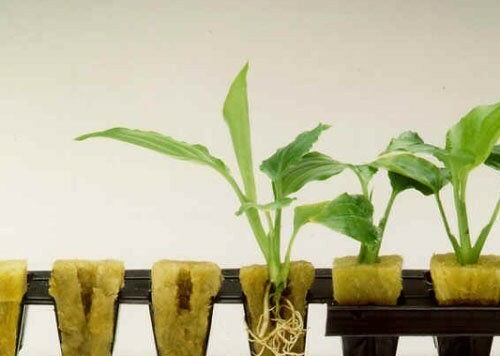 Be careful when transferring rockwool to a soilless media because the new media can wick away water and dry the rockwool cube before the roots can reach the new soilless medium. Therefore, it is crucial for the plant’s root system to be well established before transplanting. Rockwool is an excellent option for soilless material for both hobby gardeners and commercial farmers. To learn more about rockwool, you can read a previous post on the Benefits of Rockwool as a Growing Medium.